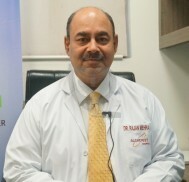 Dr. Rajan Mehra, MBBS, MS, M.Ch(Cardiothoracic & Vascular Surgery), is Head of Department of Cardiothoracic & Vascular Surgery and Senior Consultant Cardiac Surgery at Alchemist Hospital, Panchkula. Prior to joining Alchemist, he was associated with Cleveland Clinic, Cleveland, Ohio, USA; Maimondies Hospital, New York, USA; Westmead Hospital Sydney, Australia; Flinders Medical Centre, Adelaide, Australia. Besides this, he has worked with Tagore Heart Care & Research Centre, Jalandhar for about 9 years. Dr. Rajan Mehta is member of various national & international associations. He actively participates in workshops & conferences to enhance his practical knowledge with the recent advancements and technologies .